Nepal is very famous place for hiking, trekking, traveling and expeditions and if all of these are not enough then try biking. 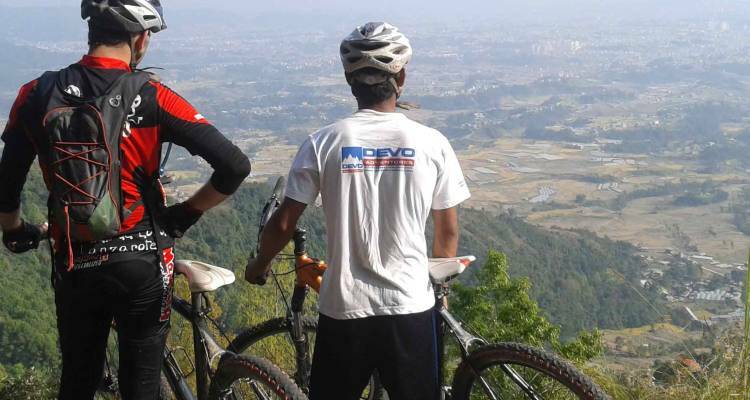 Biking in Nepal is fun and adventure which tests your mental and physical strength. Biking trip gives you a new joy in your life and teach you lesson of how to maintain you body and keep it in shape. Biking trip is been done from the past 30 years. At that period there were very less cycling group in Nepal for cycling and now it has gone up. Numbers of people want to do tough cycling routes and those people has got the route as they want and amazing views of the Himalayas and different valley. Now a days you can rent a cycle around $10-1$5 depending upon the shop. The cycling company not only provides you bike on rent if you want then you can pay for a guide too. Before your departure for cycling trips from Katmandu take a good look in the parts of your bike like gear, brakes, handle and helmet. Go out of the bustling streets of Thamel leaving the city behind and rive outside through Nagarjung Conservation Area for a wile and ride towards the plain/up roads towards Kakani. The 3 hrs. ride from Thamel to Kakani will make you body little bit tired but you will forget all the tiredness after the magnificent view of mountain ranges from Kakani. After having lunch at Kakani we will start out cycling towards off road the 5 min. down hill will makes you energetic and gives you more power through out the trip. We will pass the training ground of Scout Nepal and start our adventurous trail through dense forest. The train was used for Cycling Championship course towards Budhanilkantha on jeep single track. You will pass the Shivapuri National Park forest to Budhanilkantha a remerkable stature of Lord Vishnu lean. on the loop of snake king in the middle of small pond.